Hey everyone! So it's getting to that exciting time of the year where lots of people are getting prepared to go to university, whether you've got a conditional offer, or unconditional, getting ready to start this new chapter in your life can be so daunting so I've prepared some advice for you guys! 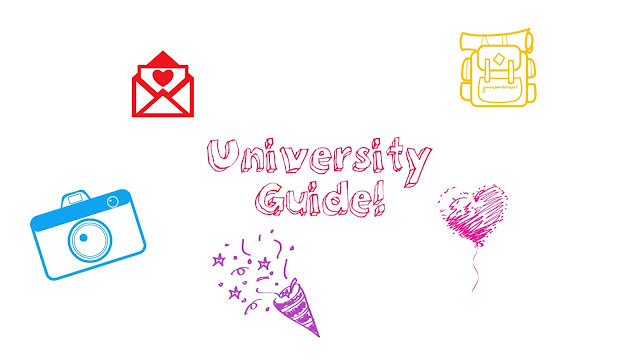 I've also got some tips if you're thinking of applying to University for next year, I hope you enjoy them! This can be the hardest part about applying to university because you're ultimately choosing where you're going to be living for the next few years of your life, so make sure you choose carefully! DO go and look around the university before you apply to them, I would strongly advise going to as many open days as possible as you get to have a good look around the university and you can explore around the location, check out all the local activity and see if its somewhere where you feel you'd fit in. DON'T just choose a university just because your friend of your crush is going there, because although its a place it suits them it might not be somewhere which is right for you. Also, I can assure you you'll make a tonne of new friends when you go to uni so don't worry! DO apply to a university which is within your predicted grades - there's no point in applying to a university which only accepts applicants who are achieving AAA grades when you're predicted BBB. The truth is universities generally tend to look at your grades before anything else so just use your choices wisely. Have a look at the league tables, look at your predicted grades and go from there! Small first aid kit - plasters, painkillers etc..
Bear in mind that when you move into student accommodation, some things are already provided so make sure you check before hand so you don't end up taking things you don't need! There's so many mixed emotions when you get into university, but try and keep as positive as possible, because it will end up being an amazing experience! Get involved : Join as many societies and clubs as possible! They are the best way to meet new people who are interested in the same things as you and it gives you a chance to get involved with university life. You're paying a lot of tuition money so you may as well get the most out of it! Homesickness : It can be really hard at first not to miss your family and friends, I'd advise ringing/skyping as little as possible in the first month or so just so you settle into university life. It's also good to stay at university and not go home all the time just so you get used to the environment. Get involved with different activities, focus on your course and just try to enjoy the experience as much as possible. Bad flatmates : Omg this is the worst! I've had my fair share of rubbish flatmates, everyone comes from different backgrounds but sometimes it's just so hard to cope with when they're so horrid! If you are stuck with people you really don't get on with and its ruining your uni experience, see your accommodation office or speak to someone who can give you advice as to whether you can move or not, try to do it as early as possible though! Drinking : If you're not a drinker don't get pressured into doing something you're not comfortable with. Freshers can get pretty messy but if you ask around on your university freshers group on facebook, you'll be able to find people who are just like you and you can get together and do different things which don't involve alcohol. Social Media : Facebook is a fantastic way of meeting people and getting involved before you even go to uni! Be sure to check out freshers groups, uni groups and your course group and get to know people so you're a bit more prepared. You can also see what events are upcoming and who's going to them, its overall just a great way to communicate with people. Don't Forget : University is a fantastic experience, and one which many people around the world don't get to have. Make sure you have fun, get involved with as much as possible and don't take it for granted. Its important to make sure you have good attendance as Student Finance can actually stop funding you if it gets too bad, or you could even get kicked off the course! If you really hate your course its important to either swap it at the beginning, or start looking for a new one after your first year, or if you decide university really isnt for you, it's best to get it sorted as early as possible. The universities have a lot of people who can give excellent advice so it really does help talking to someone. I hope you find this post helpful! Let me know if there's anything you want to add in the comments below!